Manuel Marchetti, the proprietor of the excellent Piedmontese estate of Marcarini was in Edinburgh for a series of tastings organised by his Scottish importer, Raeburn Fine Wines. This was a private tasting for trade and press, held in The Vaults, Raeburn’s historic and atmospheric old cellars near the port of Leith. Lunch was taken afterwards along with some rare wines from the Marcarini estate. This was a fascinating chance to evaluate these wines with food: as they should be drunk. The range from this producer is just part of an impressive portfolio available at Raeburn’s. Sig. Marchetti was showing 5 of his wines, each in two vintages. These represented his 3 red wine grape varieties: the Dolcetto and Barbera d’Alba and three Nebbiolo wines: the Nebbiolo Langhe and two single-vineyard Barolos from la Serra and Brunate. There was also a sneak preview of the 1996 Barolo Brunate which is bottled, but not yet released. After the tasting we had lunch and enjoyed 3 ravishing wines: the wonderfully creamy Moscato d’Asti (Marcarini’s only white wine), the enthralling Dolcetto d’Alba Boschi de Berri” which is made entirely from pre-phylloxera vines, and finally the truly magificent 1978 Barolo Brunate which Sig. 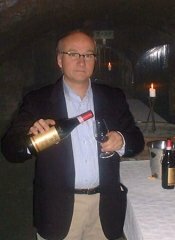 Marchetti brought from his own cellars. Manuel is a colourful and urbane character. Born in Guatemala where his father – an executive with Cinzano – had been despatched from his native Italy to set up a winery, he travelled through his childhood and young adult life, living in Mexico, Texas and Spain amongst other areas. He returned to his native Piedmont in his mid-twenties and is justifiably proud of the technical innovations he has brought to the Marcarini estate. All of these are aimed at treating his grapes and making his wine as gently and naturally as possible. He is something of a traditionalist however: his Barolos are not aged in the controversial 225 litre oak barriques favoured by some producers, but in large (2 – 4,000 litre) oak casks. He has nothing against the vanillin flavours of new oak – which he uses to mature 70% of his Barbera – but feels it is not appropriate for his Nebbiolo wines. The results of his marriage of old and new techniques are medium-bodied wines of considerable finesse. His fascinating Boschi de Berri vineyard has century-old Dolcetto vines which have never been grafted, the sandy soil keeping the scourge of phylloxera at bay. These have been propogated within the vineyard to renew stock, meaning this Dolcetto is a rare chance to taste a European wine as it might have tasted 100 years ago. Lovely, big, soft aromatic nose which is smoky and earthy. There is plenty of juicy, jammy cherry fruit. On the palate it is rich and mouthfilling, but with tannins and highish acidity that give it a serious edge. Very good. Perfumed, raspberry and cherry nose with deeper animal notes and a creamy roundness. On the palate there is high acidity, but the fruit is good and there’s a bitter liquorice edge that adds interest. Good. Lovely, deep cherry and burning embers nose. There’s a leathery quality too that continues onto the palate, with juicy red berry fruit and a great streak of sour acidity. Long, savoury finish. Very good. Wonderfully sweet, toffeed richness on the nose. A real depth of chocolaty fruit that is sweet and cool on the palate. Really quite elegant with fine fruit and bracing acidity into a long finish. Excellent. The nose has an earthy, charcoally, burning-embers quality but then pure, sweet, fruity perfume emerges as well as flowery nuances. Quite savoury and chewy on the palate with plenty of bitter-edged black fruit and a long, clean spicy finish. Very good. This has a super-sweet coffee and chocolate nose – similar to the ’95 Barbera – again with that toffee note. Quite weighty on the palate, but with a crisp fruitiness and a nice balance of tannins and firm acidity. Wonderful concentration on the nose of pure, sweet, violets and blue/black fruits. There are little nuances of aromatic herbs and spices and a touch of vanilla. The palate is quite drying and tannic still, but the tannins are ripe which, along with good acidity, gives a fresh, fruity length to the wine. The nose is starkly different on this maturing wine. It is vegetal and dank with a bouquet of truffles before higher-pitched, almost acetone-sweet fruity notes peep through. It is quite delicate and medium-bodied on the palate, showing this wine has really come together into a sweet, focused mouthful with softened tannins and a terrific cedary sweetness in the long finish. Lovely. Extraordinarily ripe, creamy, fine black fruits on the nose. Serious, heady and powerful, it is aromatic with nuances of bitter dark chocolate and violets. The palate is dominated by drying tannins but there’s such richness and ripeness of fruit that this already shows lovely balance. Needs several years, but very good indeed. Absolutely minty intensity of fruit on the nose. A real toffee richness, aromas of milky capuccino and caramel. On the palate the tannins shock the mouth drying and coating the palate, but again the balance of fruit and acidity is evident. Another lovely wine in the making. Much earthier, more animal nose with almost Burgundian undergrowth and truffle notes, then little glimpses of exotic spice and chocolate – even bacon-fat. The palate is again firmly gripped by tannins, and though there isn’t quite the quality of fruit shown in the ’95, it is beginning to provide savoury, balanced drinking. All Italian Astis tend to be tarred with the cheap and sweet image of much bulk wine, but fine examples do exist and this is perhaps the best I’ve tasted. It has a very pale golden colour and a beautiful nose of sherbet and peaches, a definite little almond note too. In the mouth it is beautifully sweet and dense, really creamy and mouth-filling with just a light sparkle on the tongue. There is plenty of lush, peachy fruit and fine apple acidity that freshens and lengthens the clean, pure finish. Terrific. Nose is ethereal and multi-faceted with nuances of woodsmoke, damp leaves, bark and cherries. Strikingly different from the regular Dolcetto. The palate is nicely concentrated with a silkiness about the texture and lovely raspberry fruit. Delicious and a real experience. Still a very youthful ruby colour, paling to tawny at the rim. Lovely aged fragrance on the nose of old roses, minerals and herbs. Still good creamy red berry fruit in evidence. On the palate wonderfully resolved with a sweetness at its core, gently wrapped in fine tannins and still good acidity. The wine has a gloriously long finish, and is drinking perfectly. Excellent.